I Am Your Plaything. Really. Not everyone can brag that there is a paper cut out doll version of themselves, and technically there isn’t one of me. But there really kind of is. 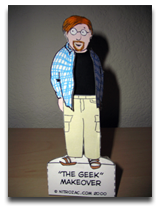 Through some weird twist in the parallel universe cross-over nexus point thingy, Geek Culture’s Nitrozac created a paper doll me. OK, it’s actually one of the After Y2K characters, but it sure looks like me. There are a couple different versions of this little digital wonder: A Shockwave-based version and an HTML version suitable for for printing, cutting out, and dressing up on your desk. The printable version had the unexpected side effect of making my nieces think it is totally normal for paper doll versions of their uncle to exist. The end result, dear reader, is that you can have a little piece of me with you any time you like, all thanks to the deliciously talented Nitrozac. Dress me up, or make me run around your office in my underpants. Bend me to your will. I am your plaything. This entry was posted in Design, Toys by jeff. Bookmark the permalink.